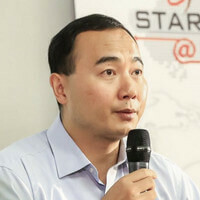 Mr. Ming Lei (雷鸣) is the Chief Executive Officer of Kuwo Science and Technology, a Chinese company dedicated to the development of music-based digital entertainment services for internet users founded in 2005. The company’s flagship product, Kuwo Musicbox, has taken the lead in meeting the number one requirement of Chinese netizens. Mr Ming Lei holds a MBA from Stanford University, United States and a master’s degree in computer from Peking University, China.